Image caption The watchdog said Friends of the Earth "agreed not to repeat the claims, or claims that had the same meaning"
Friends of the Earth (FOE) must not repeat misleading claims it made in an anti-fracking leaflet, the advertising watchdog has said. The fundraising flyer claimed fracking chemicals could pollute drinking water and cause cancer and implied the process increases rates of asthma. The charity "agreed not to repeat the claims," the Advertising Standards Authority (ASA) said. An FOE spokeswoman said the watchdog had "dropped the case without ruling". Donna Hume, a campaigner for the environmental charity, said it would "continue to campaign against fracking" because it was "inherently risky for the environment". The ASA conducted a 14-month investigation after receiving complaints from energy firm Cuadrilla and two individuals. FOE had claimed 25% of chemicals used during the fracking process could cause cancer, and suggested there was a risk of contamination to drinking water. 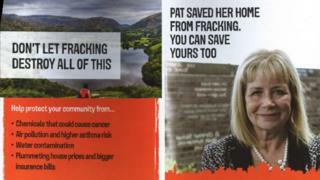 The leaflet also featured a photo of Grasmere in the Lake District, despite there being no plans for fracking in the area. The watchdog said it has "informally resolved" the case after FOE "agreed not to repeat the claims, or claims that had the same meaning". A spokesman for the ASA said the advert "must not appear again in its current form" and the FOE must "not make claims about the likely effects of fracking on the health of local populations, drinking water, or property prices in the absence of adequate evidence". Cuadrilla's chief executive Francis Egan described FOE as "the unacceptable face of the charity sector", which had been "scaremongering" in order to "frighten the public into giving it money". "[T]he charity's admission that all of the claims it made, that we complained about, were false should hopefully put a stop to it misleading the UK public on fracking." But Ms Hume said Cuadrilla "started this process to distract from the real issues about fracking" and was trying to "shut down opposition". "It hasn't worked though. What's happened instead is that the ASA has dropped the case without ruling," she said. "We continue to campaign against fracking, alongside local people, because the process of exploring for and extracting shale gas is inherently risky for the environment, this is why fracking is banned or put on hold in so many countries." In a landmark ruling for the UK shale gas industry, the government approved plans for horizontal fracking at Cuadrilla's Preston New Road site at Little Plumpton in Lancashire in October. Fracking - or hydraulic fracturing - was suspended in the UK between 2011 and 2012 following earth tremors in Blackpool, where Cuadrilla previously drilled. Does fracking affect the water supply?